Despite the sun burning her ears slightly, traffic was light and made the heat, the sleepiness, and the upcoming business meetings more bear-able. Instead of a Wednesday morning, she longed for a Friday, but had been content with the trivialities of the day, until an electric breakdown slowly brought her car to a stop, disrupting the peaceful blue-and-yellow morning that would soon give way to more tired shades of orange. She called the insurance company and was put on hold before hearing a robotic script requesting more information. Then she considered calling a garage nearby, just to shake that thought because she didn't have any phone numbers on her. She had never prepared for unexpected events. The annoyance hadn't been enough to take away her peace of mind, because the warm morning at that time of the day was capable of toning down any inconvenience. But all the waiting and delays proved to be prodigious ingredients to wear out her patience, and the good mood she had been in when she first woke up was now melting away, bit by bit, with each phone call she had to make in order to cancel her appointments. She couldn't give in to despair, though. She would wait for the tow truck, survive the lack of shade, and shun boredom. The trick was to slow down her breath, as she used to do when trying to control her fear of the dark whenever her mother closed the bedroom door. She slowly counted every time she breathed in and out, and allowed herself to be rocked by sleepiness. The apprehension that threatened to join the sweat on her temples was circling around her, but it didn't get in. After the wait and discomfort inside the tow truck, she finally arrived at the garage where the insurance company had scheduled an appointment for her. She started thinking about her stomach insinuating that it was hungry. That garage didn't look very nice, but the mechanic seemed reliable enough. Breath in, breath out, again and again. She needed to wait for the diagnostics, and how long that repair would take. Her insurance policy didn’t cover a rental, so she needed to remain calm. Unpleasant things can sometimes bring about some feelings. That's how it used to be during her childhood, when the darkness of her bedroom expanded with time and sleep never came to comfort her. She didn't cry or shake, nor did she call someone to comfort her. She would breathe and feel her belly going up and down with her little skinny hand resting on top of it. She wasn't scared of sleeping with the lights out anymore and, even if she did, it wasn't night yet and she was at the garage, trying to make herself comfortable at the corner, so she wouldn't get in the way. That place reminded her of a Spanish movie she had seen some time ago. She couldn't remember the name or who directed it; the only thing that came to mind was the image of Penélope Cruz wearing a white dress and eating tortillas with a lot of garlic. She'd look it up when she got home. She hated it when she couldn't remember the name of a movie, book, or song. And, the more she hated forgetting things, the more she would get embarrassed by it. She could store so many things in her memory, so how come she couldn't remember the title of movies she was interested in? The wooden shed was located inside the mechanic's property, next to his house; it had a high ceiling and offered enough shade. There were car bodies scattered around where a garden could have been. They were a bizarre counterpoint to the tools displayed in a very organized way on the wall. The floor and the bathroom were clean, and there wasn't much traffic on the road. It all inspired her to sit on the front steps at the entrance to the garage, where she could see the porch and the backyard, where a girl was getting ready to start playing. She remained there, looking at the scrap parts accumulated in the backyard. The highlight was the body of a Volkswagen Brasilia that doubled as the home of a very dirty dog. The child called it “Rally,” which made the woman laugh. Another dog, by the name of “Warrior,” was tied to a rope, enjoying some peaceful comfort under the chassis of a truck. There were also some construction rocks that seemed to have been there for quite a while, judging by how high the grass around them was. The commotion created by the dog and the girl was very effective. The noise seemed to be clearly targeted at the woman’s attention, who was absentmindedly waiting at the front steps of the garage. Controlling her breath wasn't enough to keep her calm anymore. On the internal monologue she couldn't quite voice, she was asking for help; they almost weren't really thoughts, but vague yearnings. She knew how useless revolts were, but she was hungry and it was making her unstable—especially because of the smell of food in the neighborhood, which indicated how far it was into the morning. If she weren't able to completely shut down her anxiety, at least she could pretend she was patient. She watched the girl from the corner of her eye, fearing that the little one would want to get closer. She wasn't good with kids. However, young girls can be persistent, and that one was determined to call the woman's attention to her actions. “Yes, my Daddy works fast, but, look: they're puppy dogs. You can see the picture on the box. Don't they look like they could be Warrior's puppies? That one, on a leash, under the truck,” she pointed at it with her index finger. The woman smiled because she liked dogs, but all she could think about was her engine running again. Without any help to put the puppy puzzle together, the girl decided to introduce herself and her canine friends. Soon she was interrogating her father's client. The little one also seemed to want to pass the time until her next event. At least that was the feeling the woman got, and that was the only reason why she let her guard down. She looked at the girl and almost forgot her dissatisfaction at being there, stripped down of the power she had behind the wheel. She looked at that small face, the big eyes that looked like marbles, and the tiny, quick mouth that shot questions and curiosities at her like darts. She had serrated baby teeth that glistened with saliva during all that talking. Why did she ask so many questions? Was she really passing the time, or trying to find her place in the world? What impressions would that little girl have of her, a woman who refused to play and tried to evade her interrogation? One day, as an adult, would something make her think back on that stranger who didn't want to make small talk while her dad fixed the car? Or would there be nothing stored in the child’s memory, no trace of the woman’s passing through that place at all? As the woman wondered about that improbable future, the little one came closer with a coloring and activities book and started talking about her life. She was spending her vacation time at her dad’s house, the mechanic; she lived with her grandma, her mother, and the dogs in a small town. She was a beautiful child, with blue-gray eyes where maybe a vague sadness resided; there was certainly a pressing curiosity there, and it was displayed rather straightforwardly. The peaceful time for siesta came and the heat was rising from the dust beyond the grass, as well as from the asphalt a little further down. The scene was only witnessed by the woman and the child, since the man back in the garage could only see the engine parts in front of him. The two of them spent the first hours of the afternoon taken by the atmosphere of that place, and the anxiety of doing something with their time. The girl kept herself busy moving around and talking; the car owner took advantage of the jibber-jabber to take a trip down memory lane. She thought about her mother’s garden and the responsibility of watering the plants on hot days like that. Then she went back further into her memories of other beating-sun days, a backyard with faded, hard-packed dirt, and an anxious child that was more used to arguments between adults than the company of other kids her age. That was a time of mourning, and she didn’t have many opportunities back them to dedicate herself to games and entertainment. The girl, the one in the present time, was now focused on putting the puzzle together; the other girl, the one in the past, was wandering silently through her old backyard, where remains of wood and other materials leftover from a construction job doubled as ingredients to create bucolic worlds—places where her tiny demeanor gave room to the genius of an explorer, similar to animation characters and heroines from those classic black-and-white movies she used to watch on a small TV in the afternoon. Following the interrogating flow of the mechanic’s daughter, the woman kept reminiscing as she observed the combination of pieces that were coming together to show a puppy rolling on the grass. She wondered if there was any part left of that young lady who used to reenact heroic wars using knitting needles for swords. She laughed at the memory of rhythmic dialogues between fictitious weapons and the remains of the construction site. The little one looked up and asked the woman what she was laughing at, but the woman changed the subject and recalled her tree house in the branches of a weeping willow, which had to be cut down because it was a threat to the kitchen ceiling. It had been so sad to look at that plot of land bare of her favorite tree. She barely noticed when she got a little closer to the small table where the child was recreating the image shown on the box, and pointed a piece that would complete the right paw of the other puppy. They cheered together when a victorious smile confirmed the right fit. The mechanic had disappeared into the shed while looking for a part that would bring deliverance, but the puzzle was coming together nicely. The girl no longer asked questions and had decided that the woman had now become her friend. Despite being empty, the woman’s stomach had stopped annoying her, and the irritation that once threatened to surface had gone away. Once again, she was breathing normally while watching the girl working on her puzzle and admiring the beauty of the resulting picture. She was floating between the spell the girl had just put on her, and the memories of herself as a child, playing in the dirt that had the color of her past. The woman was creating a mosaic herself: instead of fragments of an image, she used carvings of time and slices of memories, which she was sewing together during those hours she spent waiting for her car to be fixed. Her mental canvas brought together flower beds covered in the yellow French marigolds planted by her mother; corn fields where she picked ears of corn that weren’t fully formed; halls covered with thick sand; her first communion, and her tenth birthday. Those moments of existence were woven together much like the tapestry that covered the pavement during Corpus Christi celebrations, taking her to that unforeseen afternoon where she admired the designs without paying attention to the procession passing through. The woman was creating metaphors while the child was celebrating her progress with the puzzle. Day-dreaming in false silence, tight lips, and ideas out of order. By mid-morning came the news that the car would only be ready the following day. Conjugated thoughts popped up like chaotic beams of light, just to be dissipated after the brief paralysis that the information had brought about. The woman would have to bid the girl good-bye, call a cab, and spend the rest of her Wednesday reorganizing her entire week. She looked at the traffic lights and the movement of cars and buses. The colors were changing on the other side of the window, and her mind was already back home, in the quiet living room where her fish tank awaited her to reflect multicolor movements as well. As an inert spectator, she acted as someone who woke up already defeated by sleepiness, tricked by dreams displaying scenes of tasks that were accomplished on time, just to be disappointed at the actual time wasted while her wrinkled face was still resting on the pillow. She cried like someone who falls into a deep sleep. Her tears cleared her tired eyes as she used strokes of sorrow—a sorrow so old and so intimately hers—to paint the image of the girl with whom she had successfully put together the entire puzzle that revealed the image of four German Shepherd puppies. Her internal monologue had now found a voice: When there’s nothing left, it is imperative that we move forward, despite the lack of destination. The taxi driver looked at the passenger with a questioning gaze, but decided to ignore her. After all, the traffic was moving slowly and soon she would repeat the address more clearly. He offered her a tissue, but she didn't seem to notice him. MAUREM KAYNA is from Rio Grande do Sul, a state in Southern Brazil. She was born in 1972, became a Forest Engineer in 1994, and has been passionate about books, words, and libraries ever since she can remember. In 2010, she published Pedaços de possibilidade [Pieces of Possibility], based on her blog by the same name. 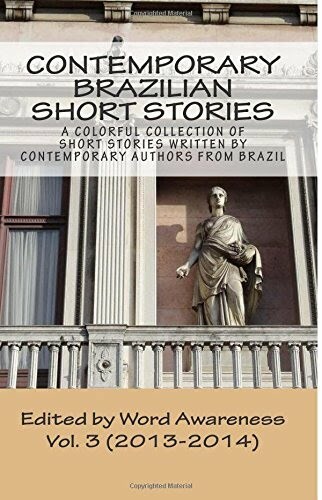 She also contributed to E-contos [E-short Stories], an eBook published as the result of a literary contest, as well as 101 que contam [101 Who Tell], a short story collection.